It’s a little known fact among non-New Yorkers that finding an apartment in New York City is a gruelling and often painful process, where one has to try and avoid scams, absurd broker fees, matchbox sized apartments and sketchy neighbourhoods. That’s why I’m still pinching myself at how Nick and I scored the most amazing little apartment in a lovely area of Brooklyn called Park Slope. Park Slope is a neighbourhood of beautiful tree lined streets, on which original brownstones stand next to each other in neat rows, each with their own inviting stoop and gas lamp. 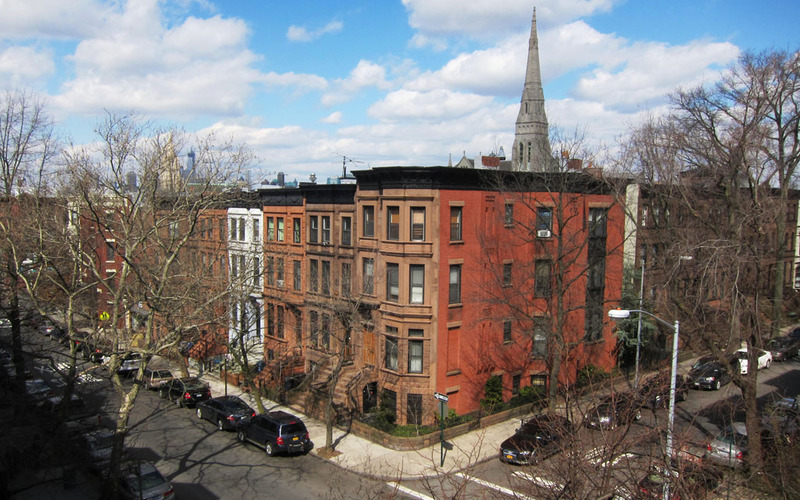 Our apartment is on the top floor of one of these historic brownstones and even has it’s own bay window, which presents you with a very Brooklyn-esque street scape of brownstone rooftops and church spires. You can even see Manhattan off in the distance too! We are also perfectly positioned between 7th Ave (equivalent to the ‘High Street’ for all you Londoners, where there are a bunch of little shops, cute cafés and tasty restaurants) and Prospect Park. Prospect Park is Brooklyn’s answer to Manhattan’s Central Park, and has a fantastic running track, a huge lake, several playgrounds, seven baseball fields and Prospect Park Bandshell that hosts free concerts in the summertime.